HyphaTracker propose a workflow for time-resolved analysis of conidia germination. Each part of this workflow can also be used independnatly , as a toolbox. It has been tested on bright-field microscopic images of conidial germination. Its purpose is mainly to identify the germlings and to remove crossing hyphae, and measure the dynamics of their growth. 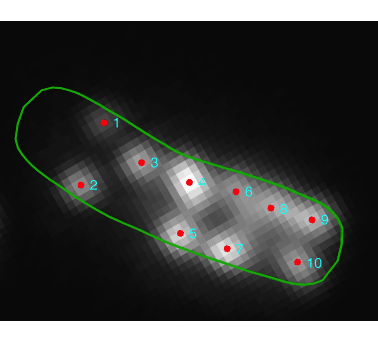 Spot detector detects and counts spots, based on wavelet transform. - Detects spots in noisy images 2D/3D. - Versatile input: sequence or batch of file. - Detects spot in specific band/channel. - Multi band labeling: automaticaly creates ROIs from one band and count in the same or an other band. - Filters detection by size. - Output data in XLS Excel files: number of detection by ROIs, and each detection location and size. - Outputs withness image with ROIs and detection painted on it. - Outputs binary detection image. Count bacterial colonies on agar plates and measure the occupied surfaces. The user has to provide a selection (roi) of the area that will be analyzed. He can than run the segmentation and if necessary correct the results. In a third step he can run the counting and measurement. 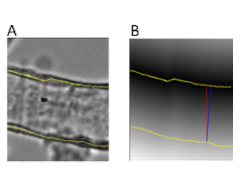 ImageJ plugin to analyze changes in vessel diameters, described in Fernández er al (2014). More specifically the paper describes the measurement of isolated retinal arterioles (ca 50 micrometer diameter) but can be used for diameter measurements of similar vessel structures. 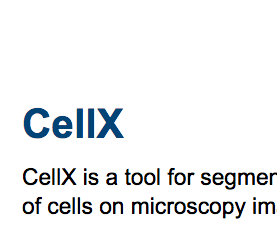 CellX is an open-source software package of workflow template for cell segmentation, intensity quantification, and cell tracking on a variety of microscopy images with distinguishable cell boundary. Installation and step-by-step usage details are described in Mayer et al (2013). 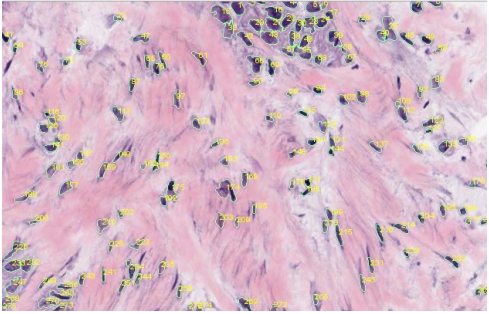 After users provide a few annotations of cell sizes and cell boundary profiles, it tries to match boundary profile pattern on cells thus provide segmentation and further tracking. It works the best on cells without extreme shapes and with a rather homogeneous boundary pattern. It may not work well on images with cells of sizes only a few pixels. 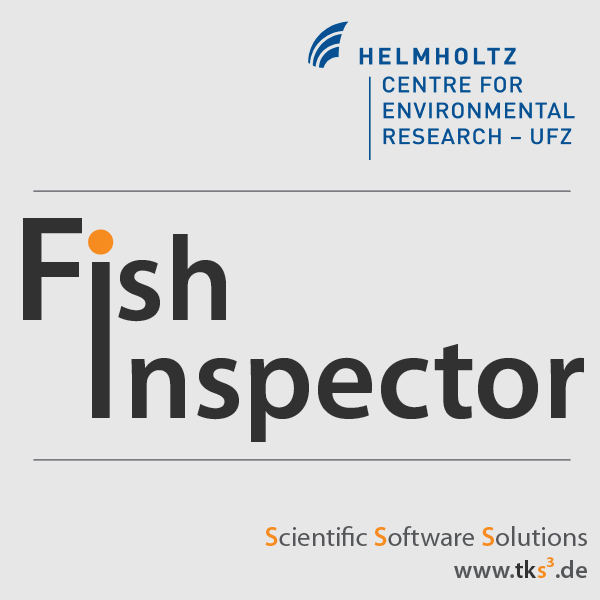 Its output comprises control images for visual validation, text files for post-processing statistics, and MATLAB objects for advanced subsequent analysis. Oufti (previously named MicrobeTracker) is a MATLAB application / suite of tools for analysing fluorescent spots inside microbes. MicrobeTracker can identify cell outlines and fluorescent foci, and generate plots and statistics based on positions and intensity (kymographs, histograms etc.) The MATLAB code is easy to modify and extend to add additional plots and statistics: see e.g. Lesterlin et al. (2014). The Outfi Forum is quite active. This plugin is bundled with Fiji. For installation in ImageJ1, download from the link below and manually install the class file. 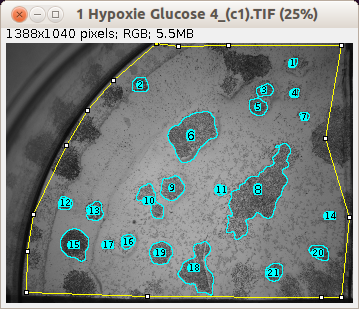 The colour deconvolution plugin (java and class files) for ImageJ and Fiji implements stain separation using Ruifrok and Johnston's method described in . The code is based on a NIH Image macro kindly provided by A.C. Ruifrok. The plugin assumes images generated by colour subtraction (i.e. light-absorbing dyes such as those used in bright field histology or ink on printed paper). 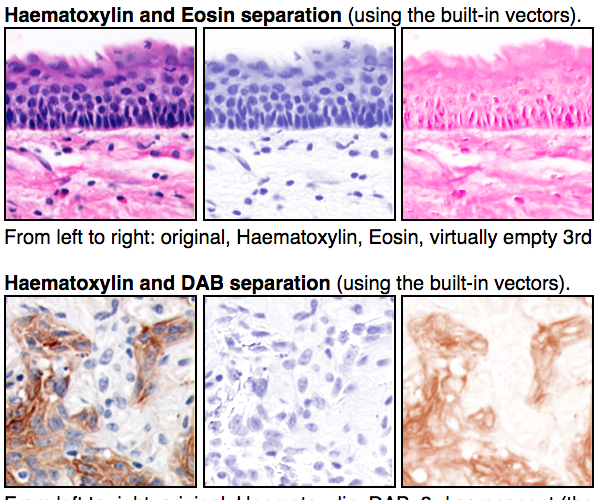 However, the dyes should not be neutral grey (most histological stains are not so). If you intend to work with this plugin, it is important to read the original paper to understand how new vectors are determined and how the procedure works. The plugin works correctly when the background is neutral (white to grey), so background subtraction with colour correction must be applied to the images before processing. The plugin provides a number of "built in" stain vectors some of which were determined experimentally in our lab (marked in the source with GL), but you should determine your own vectors to achieve an accurate stain separation, depending on the stains and methods you use. See the note below.